Less than six months after it announced that candidates with an M.Phil or a Ph.D. degree would be exempt from clearing the National Eligibility Test, the University Grants Commission is all set to revert back to the selection criteria for appointing lecturers. The Left parties today rapped former Defence Minister and NDA convenor George Fernandes for dragging the names of President APJ Kalam and UPA chairperson Sonia Gandhi in the controversial deal of Israeli Barak missile. Having earlier astonished many by their stand on the reservation issue, the National Knowledge Commission set up by the Prime Minister last year says its final report on education will surprise “the Prime Minister” himself. When leaders of all political parties sit together on Friday, ostensibly to discuss the various problems arising from the ongoing work on the delimitation will be constituencies, the real purpose of the deliberations is to delay this exercise given its far-reaching ramifications. The Centre is planning to work out a new farmer-friendly agro-forestry policy to ensure direct economic benefits to farmers and the wood-based industry, while ensuring that agro-forestry develops as a priority sector. The Supreme Court’s order today against the remission of sentence on “extraneous reasons” assumes importance not only in view of the pending mercy petition of Afzal Guru but also because of the political embarrassment caused to the Congress government in the state. The situation in Jammu and Kashmir and the North-east, operational readiness and training as well as key issues like restructuring the military to meet new challenges were the focus of the Army commanders, who started their biannual brainstorming session here today. Researchers in Gujarat have designed a wide range of specialised textiles for the country’s defence personnel. Working together with the Defence Research and Development Organisation, the Ahmedabad Textile Industry’s Research Association has unveiled a range of protective clothing for soldiers deployed at Siachen. Superstar Amitabh Bachchan, who turned 64 today, received a sherwani inscribed with a poem his father Harivanshrai had written when the actor was born. The white sherwani (a long coat-like garment) was presented to Amitabh at his bungalow “Jalsa” in suburban Andheri by a fan and photographer Pradeep Chandra, who has authored coffee table book, “AB the Legend, A Photographer’s Tribute”. Paving the way for a staggered implementation of reservation in institutions of higher learning, the Oversight Committee in its final report has suggested that the central universities can implement the 27 per cent OBC quota in disciplines other than arts, humanities and social sciences like IIMs and IITs in a phased manner. The Supreme Court yesterday stayed for the time being the Punjab and Haryana High Court order on sealing of illegal shops in Faridabad from where several traders in a joint writ petition challenged the sealing order. The prosecution in the Jessica Lall murder case today told the Delhi High Court that Bina Ramani was not made an accused in the case as there was no clinching evidence against her for the destruction of evidence. Ms Bharti Yadav, a key witness in the Nitish Katara murder case, today moved the Delhi High Court seeking release of her impounded passport to enable her to come to India and depose before the trial court. The special court set up under the Terrorism and Disruptive Activities Act to hear the 1993 Mumbai bomb blasts cases today found four persons guilty of various charges. Mr Pradeep Kumar, a 1972 batch Haryana cadre officer, has taken over as the Chairman of the National Highways Authority of India, the autonomous body tasked with executing the National Highways Development Project. Highly endangered deer born in captivity. Less than six months after it announced that candidates with an M.Phil or a Ph.D. degree would be exempt from clearing the National Eligibility Test (NET), the University Grants Commission is all set to revert back to the selection criteria for appointing lecturers. Sources told The Tribune that the UGC had been “compelled to reconsider the decision to make the NET optional” owing to the “immense pressure from the academic fraternity to bring back the qualifying examination”. The commission had in April this year, agreed in principle to the Bhalchandra Mungekar committee’s interim report to the Centre, suggesting that candidates who have an M.Phil or a Ph.D. degree should be considered for the teaching posts in colleges and universities even if they had not cleared the mandatory NET. It was mentioned that following the feedback that the UGC received and passed on to the Mungekar Committee, the final report of the committee set up to review the NET may not suggest scrapping the examination. “The feedback from colleges and universities across the country is vehemently opposed the scrapping of the NET. Academics felt that there was a pressing need to restructure the examination, which was also the brief to the Mungekar Committee,” sources added. Dr Mungekar declining to comment on whether NET would be made mandatory said, “it (NET) has been left untouched. The exemption was suggested in the interim report, the final report will come before the end of this year”. “The UGC agreed in principle without realising the ramifications of dispensing with the NET. And in doing so, it has only led to students’ loss. All those candidates, who have been appointed lecturers, will they now lose their jobs? What will happen to those people who instead of preparing for the NET have registered for Ph.D. instead” questioned a senior academician. Incidentally the oversight committee set up to draw a roadmap for reservation has also suggested “increasing the frequency of the NET and making it online” to address the issue of faculty shortage in institutions. While the UGC Chairperson, Prof Sukhdeo Thorat, declined to comment, sources said a petition had also been filed in the Chennai High Court against the scrapping of the NET. “The UGC has been severely embarrassed by this decision. They have been forced to take stock of the situation by the academicians who feel that such a decision with wide ranging consequences cannot be taken on the basis of an interim report,” sources said. In a press statement issued here today, the CPM stated that the lodging of case against the former Defence Minister, the former Samata Party president and former Chief of Naval Staff for receiving kickbacks in the Barak missile deal, once again highlighted high level corruption in defence procurements. “The government and CBI should not ignore the bribe givers in this case. The Israeli company, which offered kickbacks must be proceeded against to start with. The company should be prohibited from any future transactions,” stated the statement. Former Defence Minister George Fernandes, who has been named in an FIR in the Barak missile deal, has claimed that President Kalam backed the pact. The CBI has alleged that Fernandes and his associate Jaya Jaitley received 3 per cent of the Rs 1125 crore deal as commission. The commission was allegedly paid by Suresh Nanda, son of former retired Admiral S.M. Nanda, whose house and office were also raided by the CBI. The contract for seven Barak Anti-Missile Defence (AMD) Systems and 200 missiles was signed in October, 2000 with the Israeli firm. Pointing out that the recommendations will come out in the next 90 days, Chairman of the commission Sam Pitroda said they would “surprise the Prime Minister… and the changes we have proposed will hurt and shake some people as the commission proposes to overhaul the system they are used to”. Addressing an Open House session organised by the Confederation of Indian Industry here, Mr Pitroda said, “It will create tension, I know, but that is how a system undergoes changes”. He said the commission wanted radical improvement both in the quality and quantity of educational institutions, and proposed a regulatory mechanism for monitoring it on the lines of the one in the telecom sector. He also hinted that the privatisation of education and the early introduction of English in schools would be one of the main recommendations. “We want to suggest some totally new institutions in the country,” he said. Noting that the translation industry can create half a million jobs, he said, “It has so many languages, which boast of rich literature, which can be translated into various Indian and foreign languages and vice versa”. Replying to a question on reservation in higher education, he said, “Our stand on the quota is very clear right from the beginning…we had an interaction with Mr Moily and his team and it is for the government to do what it wanted with the report”. The Delimitation Commission, which was set up four years ago to redraw the boundaries of Assembly and Lok Sabha constituencies on the basis of changed population figures, is half-way through its work. But the Commission’s proposals have created ripples across the political spectrum as these will disturb the present status quo and may hurt well-entrenched interests. The meeting on Friday, convened by the Lok Sabha leader and Defence Minister Pranab Mukherjee, will seek to forge a consensus on a number of issues but, by all accounts, the only issue on which there could be all-round agreement will be the deferment of the delimitation exercise. According to the agenda, the meeting has been called as several leaders have expressed concern over the Delimitation Commission’s work. It has been pointed out that urban seats are increasing while the rural constituencies are decreasing in view of the large-scale migration of people from rural areas to the cities which has resulted in disproportionately large size of the electorate in several constituencies. Similarly, it is felt that the seats reserved for Scheduled Castes and Scheduled Tribes must be distributed evenly and some rotation be considered. The North Eastern states have demanded that the number of seats in their legislatures be increased although the number of voters here is less than those in other states. Manipur and Nagaland Governments have faulted the 2001 census figures and have requested that the status quo be maintained. The meeting is also slated to discuss the long-pending Women’s Reservation Bill. The recommendations are based on the evaluations of a workshop on rural development through integration of agro-forestry and wood-based industries, currently taking place in the Capital. The uptake of agro-forestry in the country has been slow because of a number of impediments such as market and public-policy constraints, economic barriers, lack of farm forestry culture and technical knowledge. Till date a national-level inventory of agro-forestry does not exist to understand the full extent of its practice. On the other side, wood-based industry, which runs in thousands, largely small-scale, is also very much an unorganised sector. It is now being hoped that in the decade or so the forest-based industry and farmers can work out a way so that farmers are encouraged and motivated for farm forestry. This will not only help in sustainable supply of raw materials to the wood-based industries but also help creation of large employment opportunities for rural and tribal people. While the farmers also demand a minimum support price for their produce and better facilities, a point of view also is that the industry has to be proactive and ensure facilitation from farmers. Meanwhile, Haryana too is making efforts to work out modalities to enable the wood-based factories, which were asked to close down following the Central Empowered Committee’s instructions in September, get back in business within the next couple of months. Senior state officials told The Tribune that the state was trying to calculate how much raw material was required by the first list, which has about 90 per cent of the wood-based industries in the state, to ensure the remaining 10 per cent industries could also continue production after following guidelines. Haryana is one of the leading states in the country as far as agro-forestry goes and has one-and-a-half times more land of the total forest land owned by the government under agro-forestry. Its annual finished goods turnover is somewhere between Rs 1,000 to Rs 1,250 crore. Opposition TDP and TRS have demanded the resignation of Chief Minister Y.S. Rajasekhara Reddy. While TDP chief N. Chandrababu Naidu wanted dismissal of both Reddy and the then Governor Sushil Kumar Shinde in the backdrop of the apex court’s remarks, TRS chief Chandrasekhara Rao wanted Reddy to step down and follow in the footsteps of Sonia Gandhi. Gowru Venkat Reddy, a close ally of the Chief Minister, was granted pardon on August 11 last year by the then Andhra Pradesh Governor Sushil Kumar Shinde, exercising his power under Article 161 of the Constitution. The Congress government, specifically YSR, went out of its way to ensure pardon to his follower. The Congress leader was handed over life imprisonment by Kurnool Sessions Court in January, 2002, in the murder case involving two TDP supporters. Venkat Reddy appealed in Supreme Court which upheld the lower court verdict, but reduced the sentence to 10 years of imprisonment. The present Chief Minister, who was then the Opposition leader, visited Venkat Reddy in Kurnool jail, which kicked off a political row. No wonder, the convict was granted parole immediately after Rajasekhara Reddy became Chief Minister. Subsequently, Venkat Reddy’s wife Charita Reddy, who was elected from Nandikotkur as Congress MLA on a ticket given by YSR, submitted a representation to Shinde for commutation of sentence. Venkat Reddy had spent a little over than 3 years in jail by that time, but the government, however, said his period in the jail should be counted as more than 5 years under various provisions. The weeklong Army Commanders Conference, chaired by Army Chief Gen J.J. Singh, would review a range of activities, including counter-insurgency operations. During this meet a conclave of all surviving Army chiefs would also be held on October 15 and 16 to elicit their views on shaping the force for the future. “Discussions in particular will be held on force restructuring through optimisation of manpower to formulate a suitable long-term policy on the subject,” said an Army spokesman while adding that other activities of the Army would also be reviewed and wherever required directions would be issued for mid-course corrections. A review of training for primary tasks and important administrative matters would also be focused on, he said. The review of the situation in Kashmir and the Northeast assumes significance in view of a spurt in violence in both regions. Militants have stepped up attacks in Kashmir while the banned ULFA in Assam, one of the leading insurgent groups of the Northeast, has begun targeting security forces after spurning the Centre’s offer for peace talks. Other issues that will be taken up at the conference are the confidential roll system in the Armed Forces Medical Service, steps at the ground level to uphold the Army’s ethos, the welfare of retired soldiers and a review of the policy for marching contingents for the Army Day and Republic Day. Researchers in Gujarat have designed a wide range of specialised textiles for the country’s defence personnel. Working together with the Defence Research and Development Organisation (DRDO), the Ahmedabad Textile Industry’s Research Association (ATIRA) has unveiled a range of protective clothing for soldiers deployed at Siachen. A special body suit designed to conserve body heat in the inhospitable climes of the Himalayas is being made available to the Army, a representative of ATIRA told this reporter from Ahmedabad. The suit for a single soldier would cost Rs 10,000 whereas an imported equivalent is priced at Rs 90,000. Another product unveiled by ATIRA is bandages prepared from the shells of crustaceans like crabs and prawns. The material, called chitosan and made in collaboration with the DRDO, is designed to stop bleeding within seconds and helps heal wounds faster. Chitosan posseses antibacterial and antifungal properties and bandages coated with it stops the growth of bacteria in wounds. However, chitosan is expensive since only 50 gram can be extracted from 5 kg of shells. Officials at ATIRA say the special bandages may now be readied for civilian use as well. ATIRA’s collaboration with the defence services has yielded yet another fabric designed to protect soldiers from chemical warfare. The fabric, made of two layers of cotton fabric treated with special chemicals, can also protect against mustard gas. The inner layer of the fabric is permeable in nature in order to permit ventilation and absorption of perspiration while the outer layer is made impervious to various toxic substances. According to sources, the outer fabric is coated with active carbon spheres (ACS) to make it resistant to fire, water and oil. The DRDO is subjecting this fabric to further tests before clearing it for use by the Army. Superstar Amitabh Bachchan, who turned 64 today, received a sherwani inscribed with a poem his father Harivanshrai had written when the actor was born. The white sherwani (a long coat-like garment) was presented to Amitabh at his bungalow “Jalsa” in suburban Andheri by a fan and photographer Pradeep Chandra, who has authored coffee table book, “AB the Legend, A Photographer’s Tribute”. “This specially designed sherwani is not so formal and has a round neck collar with words A & B written in Hindi painted in black and silver,” Pradeep Chandra said. Megastar Amitabh Bachchan who swept all film awards as Best Actor for his performance in ‘Black’, celebrated his 64th birthday here today. He is perhaps the only actor to have won the Best Actor award at the age of 63. Big B has not planned any celebrations. Instead, he celebrated the D-Day with his family members and close friends. The actor has already stated that there would be no lavishness, as his 89-year-old mother Teji is ailing and is in the hospital for over two months. 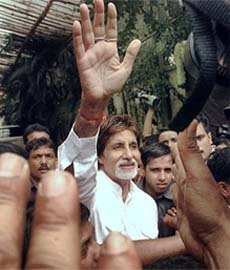 Even though the Big B may prefer to have a quiet celebration, his fans and the media like to celebrate his birthday with fanfare. It has also come up with some innovative ideas, which include awarding National Merit Scholarships to OBC students, enhancing the retirement age of faculty members and removing the ban on the recruitment of teaching staff and the introduction of networked digital campuses to help universities implement the proposed reservation. “The central universities will implement 27 per cent reservation for OBCs in the first year in arts, humanities and social sciences. For the other disciplines, it will be phased over a period of two years, extendable by one more year to a maximum of three years, where unavoidable,” the committee’s final report reads. The Indian Institutes of Technology (IITs) and premier medical institutions like AIIMS and JIPMER will implement nine per cent quota each year beginning 2007-08 over a period of three years, while there was no single formula suggested for the six Indian Institutes of Management (IIMs). In a bid to attract and retain faculty, the committee has suggested that once an institution of higher learning ceases to be dependent on the government for funds for recurring expenditure, the institute should be free to determine its own salary structure for its faculty. Vacant posts in teaching and non-teaching technical support staff like laboratory assistants and library staff should be filled on emergency basis, the report says, adding that all teaching staff should continue till the age of 62 at least. At present the faculty in the central universities and agricultural institutions retire at the age of 62 while the age limit in the case of medical institutions is 60. The committee also felt the screening of the faculty at the age of 62 and provide an extension to those faculty members found fit till the age of 65. For spotting and nurturing talent from excluded sections, the committee proposed that a “National Merit Scholarship” be extended to cover gifted or meritorious students from the Scheduled Castes, Scheduled Tribes, OBCs and others. At least one lakh scholarships should be provided each year and the amount could be Rs 12,000 a month, it says. The scholarships should be available to students of Class IX, X, XI and XII and can be based on marks obtained in the merit scholarship test conducted by the NCERT. A Bench of Mr Justice K.G. Balakrishnan, Mr Justice D.K. Jain and Mr Justice Lokeshwar Singh Panta while fixing the date for further hearing of traders’ petition on October 30, said till then the “status quo” be maintained in the matter. The direction was issued by the apex court after traders’ counsel D.K. Garg made a mention of filing of special leave petition (SLP) against the high court’s orders of July 24 and September 15, seeking early hearing of the case. Mr Garg said since different Benches of the High Court had passed conflicting orders in the matter, it needed to be heard by the apex court. Replying to a query raised by a Division Bench headed by Justice R.S. Sodhi that despite the statement of witnesses why she was not made an accused, Delhi police counsel Mukta Gupta said two witnesses in their testimony had stated differently against her. “One witness said he had removed blood stains from the spot at the insistence of Ms Ramani, however, other witness said some guest in the party told him to remove the stains,” she added. The court was hearing an appeal filed by the Delhi police challenging all nine accused in the case. In her application moved through her counsel R.K. Kapoor, she submitted that it would be difficult for her to return to India if the passport impounded by the External Affairs Ministry was not released in time. Ms Yadav is studying in the UK and had only recently agreed to depose before the trial court next month in the case in which her brother and cousin are the key accused. Suleiman Mohammad Kasam Ghawte, associate of prime accused Tiger Memon, was found guilty of conspiracy, and landing and transporting arms and explosives. Mr Pradeep Kumar, a 1972 batch Haryana cadre officer, has taken over as the Chairman of the National Highways Authority of India (NHAI), the autonomous body tasked with executing the National Highways Development Project. He takes charge from Dr Satyanarayana Dash, currently Member (Finance), who was holding additional charge as the Chairman.